I'm looking for ideas of half up and half down wedding hair ideas. 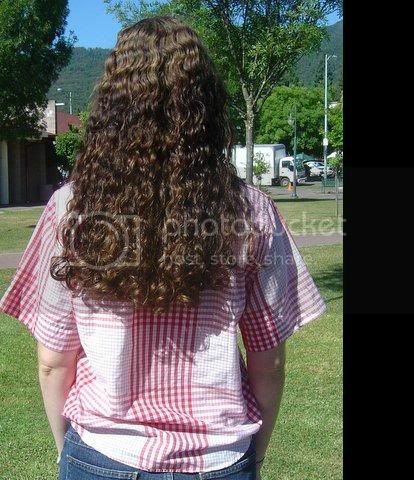 My hair is naturally a nice curly and I want to show off the curls and the length, which I hope to be near my waist at that time. This one is my fav. I like the flowers. 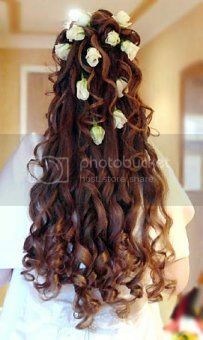 and you wouldn't have to curl your hair or anything, and it's a great style to show off the length. the first one absolutely is so gorgeous, so femine and pretty. Goodluck. Pretty!! I agree with everyone else; the first one is beautiful! I think either one would be gorgeous. I like the first one, but I'm wondering if the 2nd is the same basic style, just longer hair and bigger flowers. Your hair would be beautiful with your natural curl! I'm all about the first pic too. That is just too beautiful! 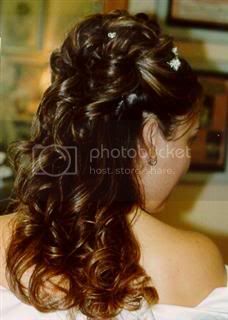 If I ever get married again (knock wood), I MUST wear my hair like that!! You're so lucky, Meg! I know your hair is just going to be killer on your wedding day.